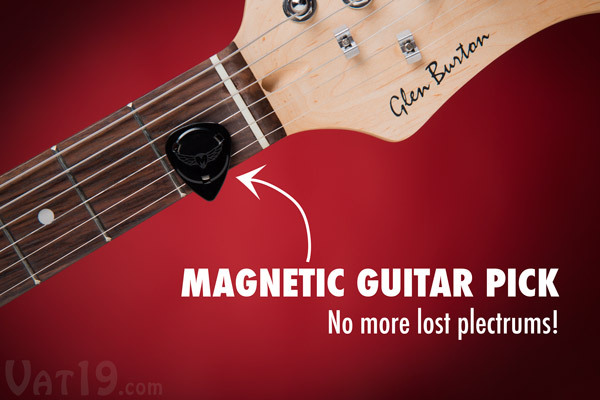 With MagnetaPicks, you'll never again lose your guitar picks. The interior of these ingenious plastic plectrums feature a circular sliver of a super-strong neodymium magnet. This means you can store MagnetaPicks on nearly any metal surface. 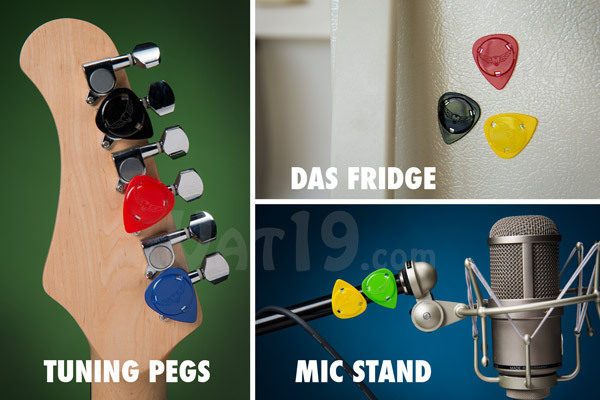 Stick MagnetaPicks to the strings of your guitar, the backs of your tuning pegs, your mic stand, refrigerator, and more! 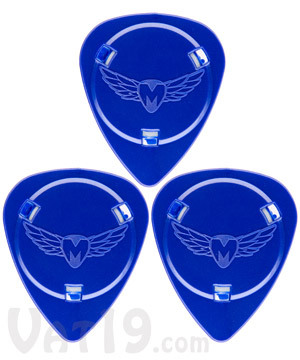 These 0.8mm thick picks (medium-to-heavy gauge) are specifically designed to not affect the tone of your electric guitar. Made in the USA from recycled materials. No more lost guitar picks! Guitar picks are fairly essential gear for guitarists. Yet, many musicians find themselves searching endlessly for picks because they're just so darned easy to misplace. With MagnetaPicks, searching through couch cushions is over. You can confidently stick these picks to nearly any metal surface. 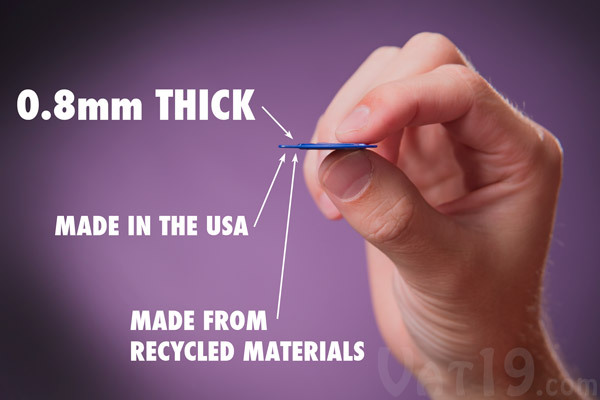 The plastic plectrum encases a thin neodymium magnet that is strong enough to adhere to the strings of your guitar, but won't jump out of your hand (or affect the tone of your guitar) while you're playing. Store the MagnetaPick on nearly any metal surface. No more lost picks! 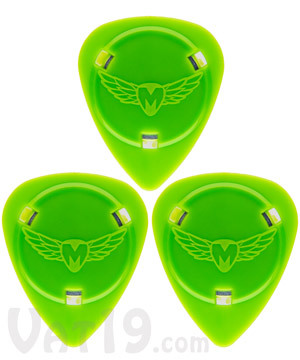 With MagnetaPicks, you'll never again be without a guitar pick. Keep them on the strings of your guitar, the back of your tuning pegs, your mic stand, refrigerator door, or office filing cabinet (hey, every office could use a little "Every Rose Has Its Thorn"). You'll find tons of useful places to stick your MagnetaPicks. MagnetaPicks were carefully designed and thoroughly tested to ensure maximum magnetic force without affecting the pickups on electric guitars. So, you can continue to thrash out the solo to "While My Guitar Gently Weeps" without the fear of sounding any different than before — which is a nice way of saying you still won't ever sound anything like Eric Clapton. 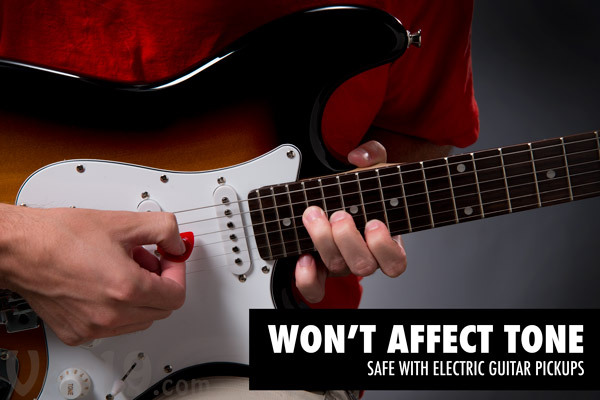 MagnetaPicks are carefully crafted to avoid affecting the pickups on electric guitars. MagnetaPicks Magnetic Guitar Picks are considered medium-to-heavy gauge guitar picks. At approximately 0.8mm thick, they are on the thick end of a medium and on the thin side of heavy. Each pick is made in the USA from recycled materials. MagnetaPicks are proudly made in the USA. MagnetaPicks are packaged in sets of three because great things come in threes. There are three Godfather movies, three branches of US government, and three pounds of gummy in the World's Largest Gummy Worm. It's science, y'all. Don't debate it. 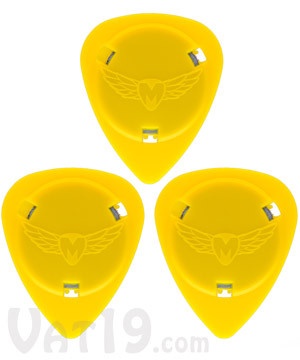 Each pack of MagnetaPicks includes three magnetic guitar picks. 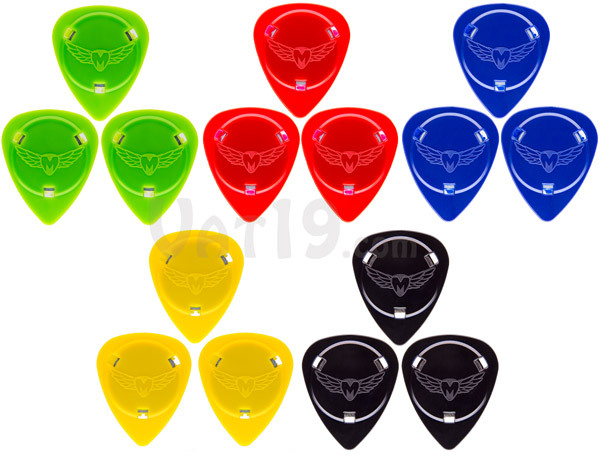 MagnetaPicks are currently available in five colors: green, red, blue, yellow, and black. Each pack includes three of one color. We do not currently offer any mixed packs, but feel free to create your own by purchasing packs of different colors (hint, hint)! MagnetaPicks are available in a variety of colors. Question: Will they screw up my electric guitar? Answer: Absolutely not! 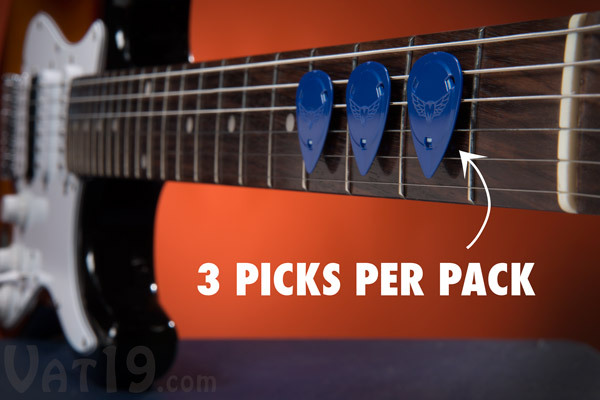 MagnetaPicks were specifically designed to be strong enough to adhere to guitar strings, but not so strong as to affect the pickups on electric guitars. They use super-strong neodymium magnets in order to provide enough attractive force in a very small size (and weight). Question: How much do they weigh? Answer: Each MagnetaPick weighs about 1.6 grams (0.05 ounces). For comparison purposes, a US penny weighs 2.5 grams. Question: Will they work with acoustic guitar strings? Answer: That depends on the type of acoustic guitar string. Most strings feature a steel core (typically magnetic) wrapped in bronze (not magnetic). Depending on the thickness of that wrapping and the magnetic properties of the core, you may or may not be able to adhere MagnetaPicks to your acoustic guitar strings. Question: Are they difficult to hold or play with? Answer: Not at all. They're very lightweight and are in the standard guitar pick shape (acute isosceles triangle). They are a bit thicker in the center (where the magnet is held), but not so thick as to be cumbersome. They only thing you'll notice about MagnetaPicks is how awesome it is that they're magnetic! Question: Will they stick to the metal plate in my head? Answer: If you'll buy if we say "yes", then "YES!"